There clearly is an appetite in America for more football. Why else would the NFL combine, draft and minicamps get almost as much attention as regular-season or even playoff games in other sports? There also is quite the gridiron void once the Super Bowl is over and the next NFL contests to pay attention to — if you really care about exhibition matches — kick off in August. 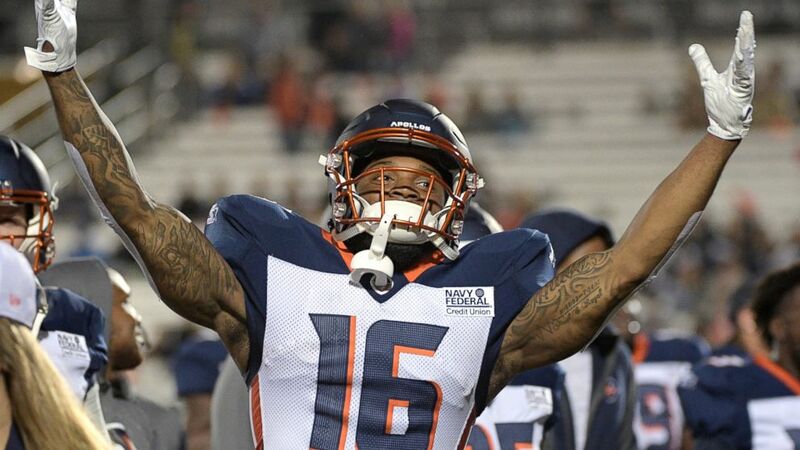 Calling it spring football when it's below freezing in so many cities might be a misnomer, but no matter how you describe it, what the Alliance of American Football presented to America in its debut weekend was impressive. Well, impressive enough to warrant continued attention and even anticipation for the remaining 2½ months of its initial season. "We're feeling pretty good this morning," Alliance co-founder Charlie Ebersol told The Associated Press on Monday. "We're pleasantly surprised. One of the things I said a lot in March last year was, no matter what happened on opening day, with ratings and attendance, was good football. Two things that really surprised us were the quality of play across all four games, and the adoption of our digital platform. The engagement numbers were so far beyond anything we could have expected. "We were pleasantly surprised that people not only wanted to see football in the alternative, but they were looking for a new way to engage with it. We started to scratch that itch a little bit." Ebersol and Hall of Fame executive Bill Polian, who is in charge of the overall football operations, worked only nine months to get the Alliance rolling. That might seem like a rush job, but the product on the field, while sloppy at times and definitely slower than the NFL brand, was watchable. In fact, it was entertaining for the most part, and the possibilities for the league and its players are intriguing. Enough of the country felt that way, too: A 2.1 rating and 4.0 share on CBS on Saturday night for San Diego at San Antonio should not be scoffed at, particularly when an NBA game on ABC had a similar-sized audience. Digital participation, as Ebersol noted, was strong. Soon, betting lines will make their way out of Las Vegas. The Alliance, which has eight teams — the others are in Birmingham, Alabama; Memphis, Tennessee; Orlando, Florida; Atlanta, Salt Lake City and Tempe, Arizona, next door to Phoenix — isn't fooling itself or trying to fool fans with the caliber of play. The nation's best football players nearly all are in the NFL. Ebersol and Polian are not claiming otherwise. What they are espousing, wisely and accurately, is that there are hundreds of other quality players still seeking their shots at the big time. So if the Alliance is helping develop a pipeline of talent for the big boys, that's a valuable thing. A necessary thing, really. Viewers and fans at the stadiums should recognize that, and see the Alliance athletes for what they are: guys eager to state their case as football players. They all believe the next step is the NFL, and that this three-month season can catapult them there. "It was the extraordinary effort that stands out, which would have been expected," said Polian, who built championship teams in the NFL for three decades. "These are guys hungry for opportunities to show what they can do. They knew America and the NFL was watching and will be throughout the season. And they gave you all they had, and I think that will continue for sure." Polian noted he received congratulations from many folks in the NFL after Week 1. "They said it looked great, it was real football, more than a few guys said that, and they saw no gimmicks," he said, adding with a laugh, "the only gimmicks are the once the coaches draw up, like the Orlando Special." Considering Steve Spurrier is coaching in Orlando, that is a given. "What they saw was real, professional football. With a capital P."
AP Sports Writer Bernie Wilson in San Diego contributed to this report.